Tree-Free Packaging made from invasive plant fibers. 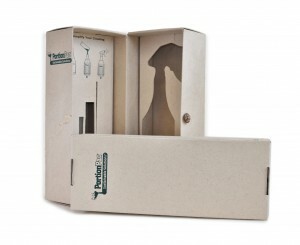 100% recyclable and compostable packaging. Keeping up with the newest sustainable packaging alternatives is like keeping up with the latest techie gadgets. The sustainable packaging market is evolving rapidly, and yesterday’s top alternative fiber option may have been replaced with a new sustainable option. We’re happy to see the great momentum and on-going development in sustainable packaging and adhesive labels. Let’s look at some of the latest and greatest in sustainable packaging and labels. Here are five hot, new products in non-tree packaging, paper and labels. All are available now. Mushroom Packaging is one of the hot success stories in sustainable packaging. 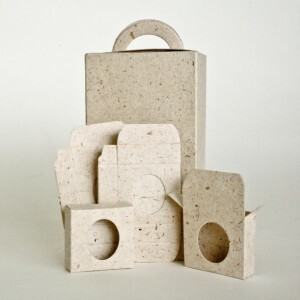 EcoCradle’s mushroom-based packaging is a great replacement for EPS, EPP and EPE foams. Village, Inc. is made from wild grass paper with recycle-compatible adhesives (RCA) adhesives. 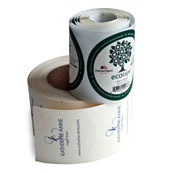 This industry-first tree-free adhesive label sticker has been an international success story. Wild Grass Packaging made from wild grass papers and 100% recycled boxboard. Custom presentation boxes are available from Distant Village. Wild grass packaging is both eco-friendly and fair trade, making this a leading sustainable packaging solution. Banana Fiber and Palm Fiber Papersfrom New Leaf Paper are excellent choices for alternative papers that work great in your desktop printer and are ideal for printing your eco-friendly resume. 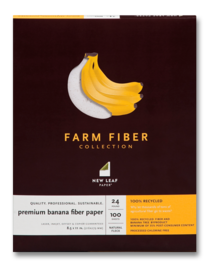 Banana Fiber and Palm Fiber Papers available from New Leaf Paper are part of their Farm Fiber sustainable and tree-free paper line-up. Cross-Fiber Folding Packaging made from a unique blend of mulberry and water hyacinth fibers (both fibers are invasive plant species) make this packing as durable, rigid and sturdy as it is sustainable and environmentally conscious. Also available from Distant Village.